It is hard to believe that Roman Reigns will lose the Universal Championship so early after finally dethroning Brock Lesnar at Summerslam this year. 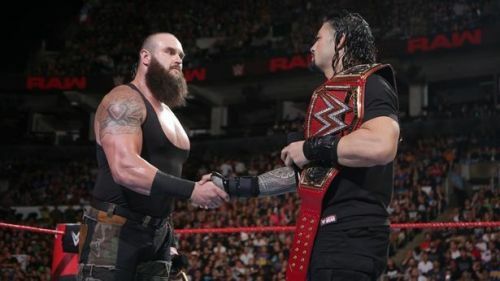 Most of the WWE universe feels the same way but his next title defense is against The Monster Among the Men, Braun Strowman, who does not loose his matches often(as he is also booked equally strong as Roman). Its really hard to predict the victor in the main event of the upcoming Pay Per View Hell In A Cell. The main event at Hell In A Cell is guaranteed to be a hard-hitting contest with some outside shenanigans from Shield and Dolph Ziggler and Drew McIntyre. If at all Braun Strowman manages to overcome the Shield's powerhouse and win the Universal title, then he may need some challengers for his future championship defense. We will take a look at 3 potential opponents for Braun Strowman. Bobby Lashley has been booked in abysmal feuds ever since he returned to WWE earlier this year on the Raw after Wrestlemania. He had a short alliance with Braun Strowman during his come back, before entering into a dreadful feud with Sami Zayn. Currently he is booked in random angles with superstars like Jinder Mahal and Kevin Owens, which are not at all captivating interest of the audience. So the WWE should change his booking direction by tweaking his character into the mould of Brock, as a destructor rather than a smiling baby face which he is portraying now. This turn will make him one of the legitimate main eventers on Monday night Raw, as Raw is lacking them currently. He is also one the Legit superstars who can be a believable challenger for Braun Strowman's title defence.